Excavation and site work are quite literally the foundation for any construction project and crucial to its success. Whether you’re build a new home, putting on an addition, adding a garage or installing a water feature, proper site work and excavation are key to making your project go faster and more cost-efficiently. If you need excavation and site work in the greater central Massachusetts area, J. T. Glynn Construction has more than 20 years of combined excavation and site work experience, including residential and commercial concrete foundations, floors, and retaining walls. Our experience and expertise ensures we’ll provide you with the proper excavation and site work and finished structure to meet your requirements. We’re fully licensed and insured for a wide range of site work and excavation — lot clearing, foundation and basement excavation, septic systems, leach field construction, and much more. Proper grading, soil compacting, and slope contouring are all critical site work and excavation elements in construction site preparation to ensure that natural settling and the effects of weather don’t adversely affect your property or structures. We handle all aspects of your site work and excavation, including soil testing, site-plan designs, zoning restriction and environmental impact research, utilities placement. 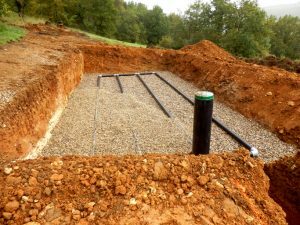 Every step of your site work and excavation is carefully planned and implemented so that every system, component, and structure is properly built and installed, according to plan, to meet all applicable state, local, and federal rules and regulations. Why gamble your critical site work and excavation tasks to an inexperienced or corner-cutting contractor when you can work with the area’s most reliable and cost-efficient construction firm? Trust your next project to theexcavation and site work experts, J.T. Construction.